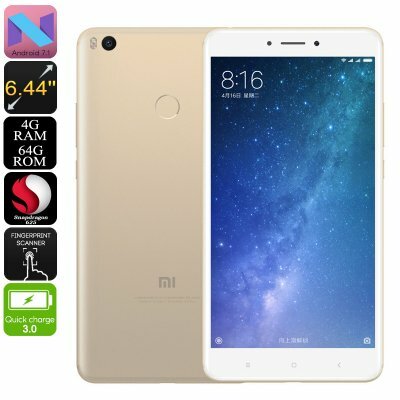 Successfully Added Xiaomi Max 2 Phablet - Dual-IMEI, 4G, Android 7.1, Snapdragon CPU, 4GB RAM, 6.44-Inch Display, 1080p, Quick-Charge 3.0, 12MP Cam to your Shopping Cart. What really sets this Android phone apart is its stunning 6.44-Inch display. This large Full-HD screen allows you to fully enjoy your favorite media like never before. Crisp 1080p resolution treats you high details and vivid colors. From now on, you’ll be able to enjoy a cinematic experience anywhere you go. This Android smartphone runs on the latest Android 7.1 operating system. This lets you smoothly enjoy the latest software features that are currently available. Whether you’re into games, movies, or simply like to browse the web – nothing is too much for the Xiaomi Max 2. With Dual-IMEI numbers and 4G connectivity, this Android phone keeps you connected at all times. It allows you to be connected to two network providers simultaneously. This will magnificently increase your coverage. Letting you be reachable on two phone numbers, this Android phone is perfect for separating your work and private life. Additionally, this phablet supports Dual-Band WiFi. Whether you’re at home, in the office, or traveling abroad – this Android phone always keeps you connected. At the rear of this thin cell phone, you’ll find a 12MP camera. This piece of equipment lets you shoot stunning photographs and breathtaking 4K video. By supporting a 128GB SD card slot, this Android phone holds enough storage to safe-keep all your files. With its ultra-fast fingerprint scanner, you’ll be able to protect all your files and unlock your phone in the blink of an eye. No longer will you have to bother wilth long passwords and annoying unlocking patterns. This Android phablet can be unlocked with the touch of your finger. The Xiaomi Max 2 Phablet comes with a 12 months warranty, brought to you by the leader in electronic devices as well as wholesale electronic gadgets..